Well, first unit is assembled, and my first 4 Redcoats are painted. Unfortunatly, that basically took all day. It has been a really, really long time since I have painted anything in 28mm, so it took some time to remember what I wanted to do with them! The first unit I am working on is the Coldstream Guards, which in Lasalle terms is a Large (+) infantry unit, or, 6 stands of infantry. I am going to be building a Guards list, not sure what my support will be for Call to Arms, it is likely to be Brunswicks, which will contribute more infantry, along with a small unit of Hussars. 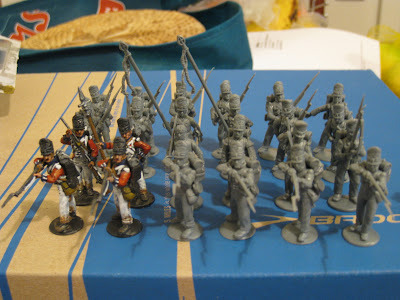 I plan to use the Perry infantry to represent my Guards Infantry and my Infantry. A mix up with my order with Warlord Games means that I have some Hanoverian heads, so some of that Infantry will be King's German Legion, which have the same rules, just different hats. Barely different actually, just a different logo. My Elite Infantry will be the Victrix Highlanders. I am using them to make it as easy as possible for me to identify my Elite Infantry on the table; rather than because the Highlanders were so much superior to the standard Infantry (such as the KGL or standard units) because that would simply be not true, it is largely a product of wargamers and rosy-eyed historians with a fondness for kilts that has done that! What does any good King need?